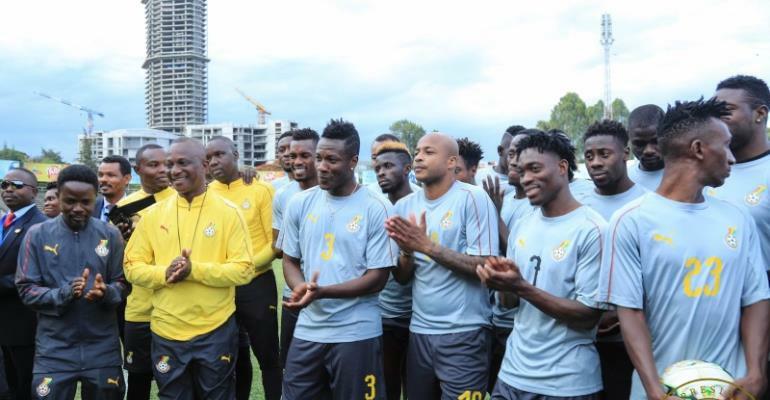 Twenty-one (21) players opened Ghana’s preparations for their final 2019 Africa Cup of Nations qualifier at home to Kenya Tuesday afternoon. Amos Frimpong, Kwame Bonsu and Felix Annan who arrived from their Caf Confederation Cup assignment in Zambia reported to camp and were involved in the session held at the Accra Sports Stadium. Other new players include Ernest Asante and Joseph Aidoo – enjoyed their first session as Black Stars players likewise returnees Kwesi Appiah, Jeffrey Schlupp, Alfred Duncan and Alhassan Wakaso. “Andy Yiadom is injured. Unfortunately, after the scan, it’s reported that he cannot come. "For that reason, Daniel Opare is taking his place,” Coach Kwasi Appiah told reporters at the end of the session. Ghana will host the Harambee Stars at the Accra Sports Stadium on Saturday, March 23. It is the first time in three years that the Black Stars will be playing in front of their fans in the country’s capital. Kickoff is 18:00 GMT.